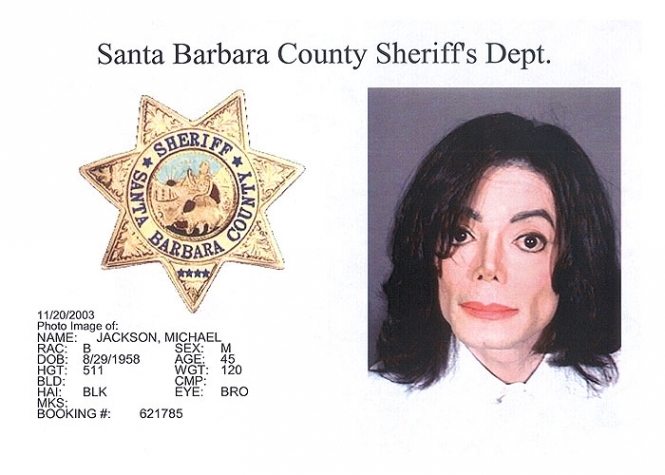 Michael Jackson was photographed by the Santa Barbara County Sheriff's office following his November 2003 arrest for child molestation. The 45-year-old "King of Pop" was released after posting $3 million bail. Submitted by Jerk_Cat on Fri, 2011-03-18 14:36. Damn, 5'11" and only 120 lbs? Submitted by AFVetgrrl84 on Sat, 2011-05-21 22:12. Submitted by antiz on Mon, 2011-02-07 19:44. He looks great! Sorry you OD'ed.